Watch the Nonito Donaire vs William Prado on Pinoy Pride 30 Live Streaming, Fight Results, and Replay Video Soon this March 28, 2015. Offers round by round result of Donaire vs Prado on Pinoy Pride 30 with live streaming, fight results and video of the fights. Fight Update: Nonito Donaire defeated William Prado via TKO in 2nd round! The Donaire vs Prado fight is brought to you by ALA Boxing Promotion in partnership by with ABS-CBN at the Smart Araneta Coliseum (Quezon City, Philippines) via “Pinoy Pride 30: D-Day. The Pinoy Pride 30 will be headlining the bout are WBO Light Flyweight champion Donnie “Ahas” Nietes and former world boxing champion Nonito “The Filipino Flash” Donaire. Also fighting on the card is reigning IBF Intercontinental Super Bantamweight champion “Prince” Albert Pagara, a Leyte (Visayas, Philippines) native, as he defends his title against former WBO NABO Super Bantamweight champion Rodolfo “Fofo” Hernandez of Mexico. Also AJ “Bazooka” Banal, another Cebu City native, will also step in the ring against Indonesian fighter Junior Bajawa for eight rounds. Ryo Akaho of Japan and Prosper Ankrah of Ghana will also go head-to-head in the line-up of the undercard matches. "With my team now, I do believe that this fight is very important for us because of the previous fight," Donaire said in a press conference at Solaire Resort on Thursday (March 26). He will be returning to the super bantamweight division (122 pounds), a class where he was clearly the best. Cutting down his weight will be beneficial for the former five division world champion. Donaire (33-3), who will stage his bout in the country for the fourth time, clashes with Brazilian William Prado (22-4-1) in the co-main event. "I respect him as a fighter. We really worked hard. We do expect an entertaining and tough fight," said Donaire. Is there still anything to prove for Donaire in this fight against William Prado? What do you think? Donaire (33-3, 21 knockouts) will be making his first appearance in a boxing ring since his sixth-round technical knockout loss to Nicholas Walters in November. 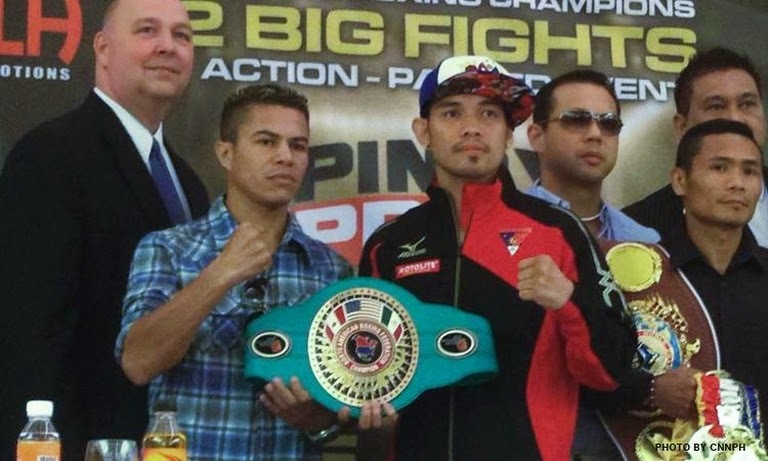 The fight will also be Donaire’s first in his country of birth since his 2009 knockout of Raul Martinez. Donaire’s return to the 122-pound division marks will mark a return to the division where he had his greatest success as a fighter, where he capped off 2012 by nearly becoming the undisputed champion and earning the BWAA Fighter of the Year award. The Donaire-Prado fight will take place in the super bantamweight division, as the 32-year-old Donaire is moving back down from the featherweight division following a 6th round knockout loss to WBA featherweight champion Nicholas Walters last October in Carson, California. Prado has good punching power, and you never know if he can get Donaire out of there. Prado will need to try and get to Donaire quickly before he has a chance of getting his own offense in gear. At 32, it’s strange that Donaire is being matched so softly following his loss to Walters. When you’re as old and as experienced as Donaire, you would think that he doesn’t need confidence builder type fights. Donaire should be able to bounce back and face top level opposition. Donaire needs to fight out sooner rather than later whether he still has the talent needed for him to win a world title in the super bantamweight division. Donaire previously held the IBF and WBO 122 pound titles in the past. He lost his belts against Guillermo Rigondeaux back in April of 2013. But since that loss, Donaire has fought Vic Darchinyan, Simpiwe Vetyeka and Nicholas Walters. This is the comeback fight for Nonito Donaire. It's now or never for Donaire since he still has the power and speed for this fight. Watch out for the Nonito Donaire vs William Prado on Pinoy Pride 30 Live Streaming, fight results, and video replay soon.